Giorgos Germenis was one of 21 members of the neo-fascist Golden Dawn party elected to the Greek Parliament in recent elections. 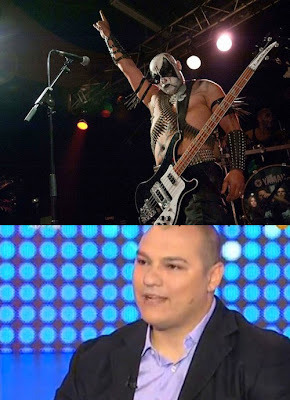 He's a member of a black metal group Naer Mataro. Germenis will represent the Golden Dawn for the Greater Athens district in parliament. He’s known by the stage name “Kaiadas.” That’s the chasm in ancient Sparta where children were thrown to their deaths after being judged unfit to meet the rigors of Spartan life (a hint perhaps in how he and his friends might be dealt with). This article by anthropologist Neni Panourgia on Aljazeera's Opinion pages is worth a read as it mentions the fascist Gramcsian entryist tactics, discussed at length elsewhere on this blog, being currently employed by Golden Dawn. I can't link to it directly but the article is titled: "Greece's neo-Nazi Golden Dawn is a European problem". "The neo-cons, the neo-fascists, and the neo-Nazis have been selectively appropriating leftist discourses and practices in order to obscure and obfuscate the distinctions between left and right. Michaloliakos, the coddled child of the junta, uses the term "junta" pejoratively (to indicate the totally inept but democratically elected Greek government, the press, and the memorandum), calls the actions of Golden Dawn "national resistance" when he instigates violence against immigrants and politicians, and has warned about an "uprising of the masses"."